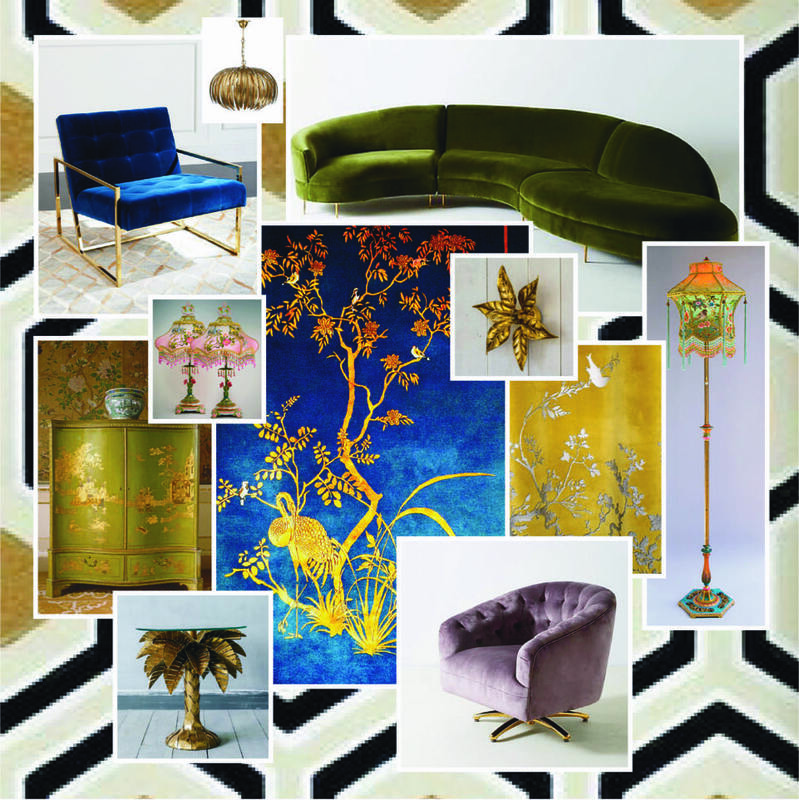 I thought a mood board for my Jardin de Chinois wool and silk hand-knotted rug would be easy. I guess I was half right – there are so many beautiful products out there to choose from….the problem is that I have to whittle them down to a select few! Wallpaper is a minefield….is that the right word?! I’ve pondered over the walls for our tiny front porch for what seems an excruciatingly long time – my excitement rises as I fall upon the perfect roll, then another comes along and I’m back to square one. It seems social media has given us the ultimate look book but with that power comes responsibility – one must develop a strong will to move on! Perhaps if I introduced a budget to my mood boards I would get them done a might quicker…..but that would be no fun! Rather than go for the obvious beauty from De Gourney, I thought I would add a dash of sophisticated glamour to my scheme in the form of a geometric. I instinctively found myself drawn to a Chinoiserie Lattice design. This led me to F&B Enigma and Thibault too but in the end I plumped for the classic hexagon wallpaper by David Hicks. It’s rather fabulous! So easy to buy virtually! I can’t help myself when it comes to lush colours in velvet, and that gold finger chair is absolutely gorgeous. With soft, feminine edges on its curvaceous silhouette, this luxe respite pays homage to one of Vladimir Kagan’s most iconic and sinuous designs. Featuring solid brass legs and ample room for seating, it’s a natural place for conversations to flow as its unsurpassed visual energy enlivens your room. It comes in 4 delicious colours….kingfisher, charcoal and navy, along with this sumptuous green. Oh my what a chair! Perched on a brass-finished base that offers a 360 degree view of your room, this feminine take on swivel seating is complete with button tufting and a plush, generous seat that easily complements your room’s most modern pieces, lets hope this makes it to the UK, I have been on the search for the perfect pink velvet chair for some time now and this ticks all the boxes and more. The 1920s antique floor lamp with flowers has been hand painted and holds a hand-dyed Chinoiserie Aviary silk lampshade. The lantern shaped shade is ombré dyed from orange to celadon to teal and has six panels with an abundance of birds and flowers of vintage hand embroidered appliqués with gold threads. The top of the lantern is covered with a rare antique Chinoiserie tulle from France and has ivory bird and leaf motifs. The shade has hand-beaded fringe in colorful matching tones. It lights up beautifully! A jewelled pull chain and six long tassels hang from the shade and complete the lamp. These amazing lamps speak for themselves – how could one resist such beauty! I seriously recommend you check out her website – unsurprisingly, her clients include the rich and famous……as I said one can dream. I love the eccentricity of this table, mixing up the chinoiserie of Jardin. This table possesses serious glamour and a beautiful side table is the perfect way to add radiance to your room. How lovely are these, naturally you are most likely to require 2, either side of the mantle I think, I have never got round to proper grown up lighting but I think these with their aged gold ornate flourish would pick out the gold silk formJardin beautifully. The bulb bursts from the centre of opening leaves, bringing a warm burnish gold glow to your home.